What is this about? Drivers who remain on the vehicle deck of ferries pose a danger to themselves and can cause delay in emergency response. The UK’s Marine Accident Investigation Branch has published a report. Five members of the Parliamentary Committee on Finance, Transport, Environment and Energy have written an open letter to Bastø Fosen. The letter was published on 17 April in Moss-Avis. The aim is to improve the viability for the city of Moss, by applying some changes to ferries, terminal and roads. Moss suffers from congestion due to ferry traffic. The ferries have to be full electric and thus emission-free. On some given departures heavy traffic on the ferries must be avoided. The Moss ferry terminal has to be moved closer to the train station. Highway 19, going through Moss, must be tunnelled. Bastø-Fosen’s State contract expires end of 2026. The politicians ask to speed up the tender process, in order to give the ferry operator enough time to make the proper investments. “By clarifying who has a license in 2027 as early as possible, it will be easier to plan in a longer perspective. We hope for a dialogue on this issue,” say the MP’s. Bastø Fosen has hybrid ferries on order. GLEN SANNOX is late 13 months, sister vessel, Hull 802 is 19 months behind schedule. Shipyard Ferguson and CMAL are currently in dispute over the problem-hit project. The delay was announced in the Scottish Parliament. Flensburger Schiffbau-Gesellschaft does not want to apply for a state guarantee, for the time being. That is what investor Lars Windhorst told the media. It would take too much resources, he said. He says FSG can finance its orders internally. Red Funnel is to trial a new advanced vessel positioning system at the end of April that will boost the efficiency of its high-speed ferry service while cutting emissions. Southampton marine technology firm Azurtane is developing the system. Working in conjunction with Red Funnel, trials will be carried out on the ferry operator’s high-speed craft RED JET 7. 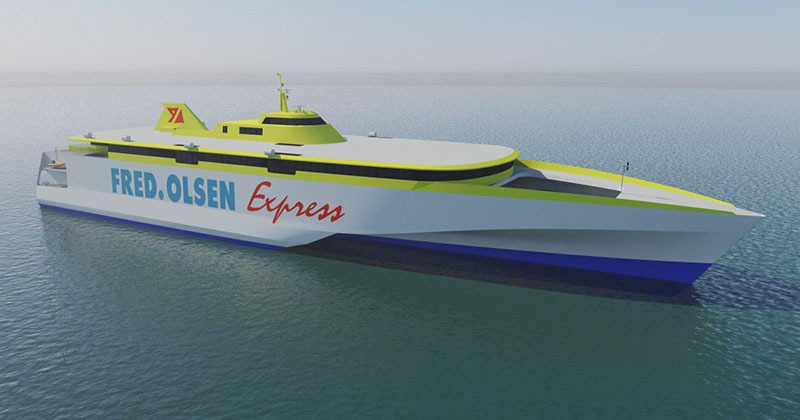 Construction has commenced of the second of two 118m high-speed trimaran ferries for Fred.Olsen Express. A metal cutting ceremony for the BAÑADEROS EXPRESS was held in the Philippines shipyard, where the official names for the new vessels were officially announced by Fred. Olsen Express. The first will be named BAJAMAR EXPRESS. FRS will have a reshuffle: Chartered GOLDEN BRIDGE will sail between Motril and Mellila. VOLCAN DE TAUCE will sail from Motril to Tanger Med, with passengers. Motril is becoming an important hub for North-Africa. Brittany Ferries’ HONFLEUR will most likely not enter service until 2020. Tirrenia charters Greek ro-pax ARIADNE for Napels-Cagliari.